As promised, here are more great photos of last weekend’s 149th anniversary Civil War reenactment of the Battle of Collierville in Collierville, Tennessee. I would like to extend a special thanks to Lee Millar for inviting me, and to everyone who attended. I had a great time talking to people about my new novel, A Beautiful Glittering Lie, the sequel, A Beckoning Hellfire, and my Renegade Series. 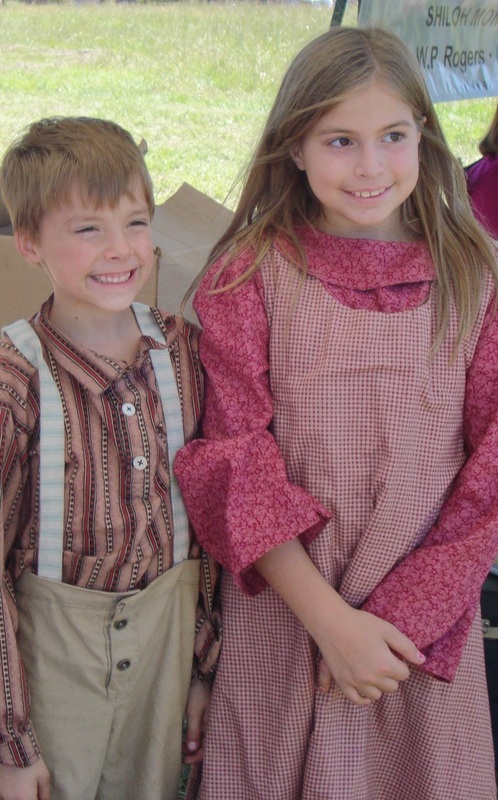 I had so much fun at this event that I encourage everyone to attend next year’s reenactment. Personally, I can’t wait! 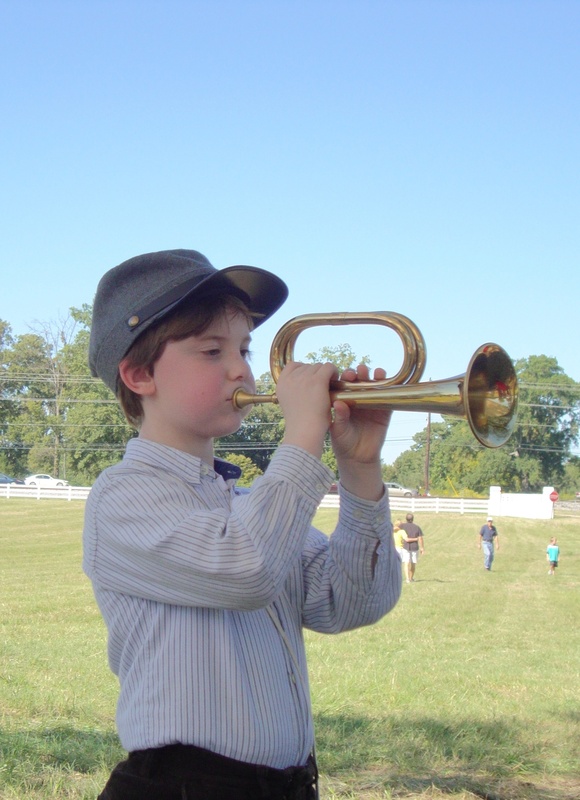 Yesterday’s reenactment of the Battle of Collierville drew hundreds to Schilling Farms in Collierville, Tennessee. Besides spectators, many reenactors showed up as well. Not only do adults participate in the fun, but so do children, as shown in these photos. These kids had a great time posing for pictures and playing with the two dachshunds we brought along. The reenactment was the 149th anniversary of the battle. On Sunday, October 11, 1863, Brigadier Confederate General James R. Chalmers confronted Union Brigadier General William Tecumseh Sherman. The Rebels drove the Federals into a fort, but then withdrew. The battle lasted five hours. General Sherman was nearly captured during the battle. 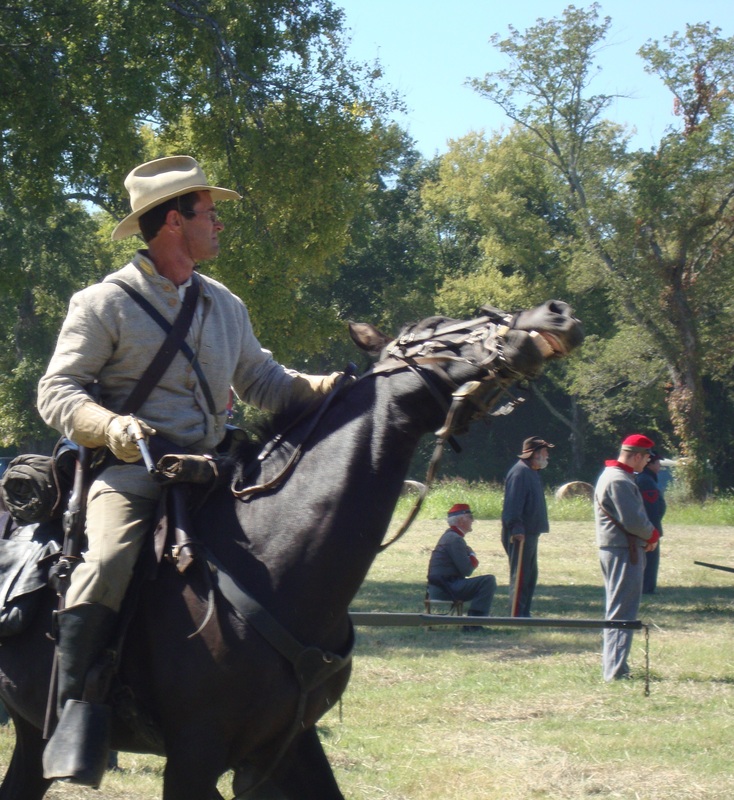 His horse, Dolly, was captured. 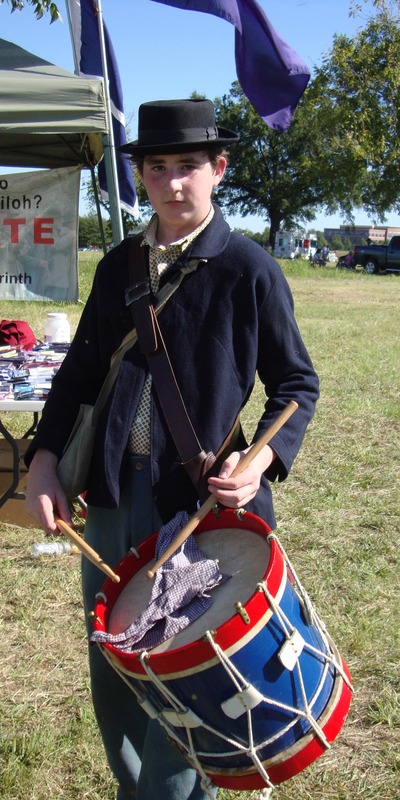 This brave Yankee drummer boy was killed during the “battle.” Luckily, he came back to life to pose for this photograph! Please stay tuned … I will be posting more pics later on this week! Last Tuesday, I had the honor of being invited to speak at the Senatobia Public Library in Senatobia, Mississippi for their monthly “Lunch with Books” series. At once, I was overcome with the beautiful small town. I had never ventured over to Senatobia before (it is about 25 minutes from where I live), but now I’m glad I did. Once I arrived, I was greeted like an old friend, and whisked into the meeting room, where a group of ladies had already congregated. While their social club, which has been getting together for over ten years, enjoyed their lunch and conversation, I set up a book table and spoke with Rosa, the woman in charge. She gave me a stellar introduction, and I delved into my topic, discussing my new Civil War novel, A Beautiful Glittering Lie. The thing I really love about talking to Southerners is that they are still very adamant about their love of the Confederacy and their loathing of Yankees! Rightfully so, after hearing some of their horror stories, and they all have such wonderful stories to tell about their ancestors. Although they insisted that I tell them where I was from, they came to the conclusion that I was a Christened southerner, which made my day. Thank you so much, ladies, for your hospitality and spirit. Book signings like this make it all worthwhile! Last weekend marked the 150th anniversary of the Battle of Antietam. For the occasion, numerous events were scheduled to take place at Antietam National Battlefield Park near Sharpsburg, Maryland. The battle, which transpired on September 17, 1862, was the bloodiest single day in American history. Over 23,000 soldiers were killed, wounded, or missing. 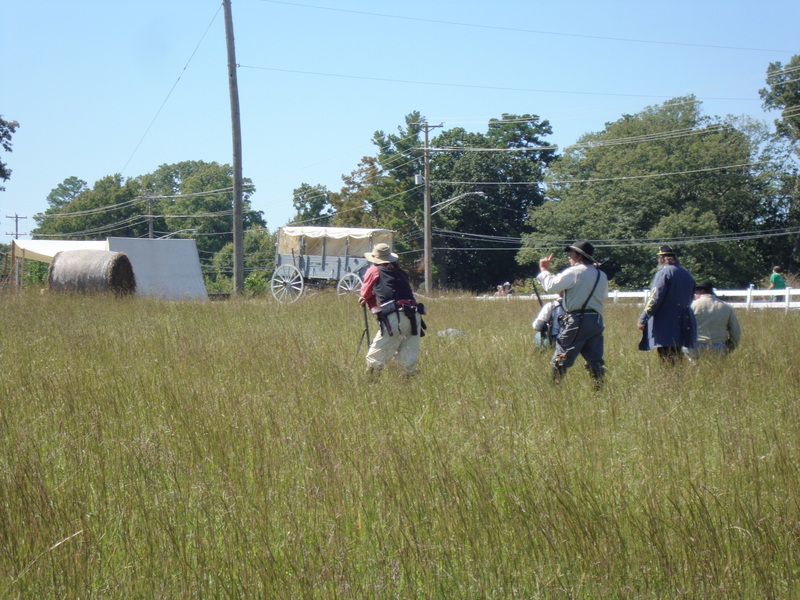 Last weekend, hundreds of spectators and reenactors transcended upon sacred soil to recreate the terrible ordeal. 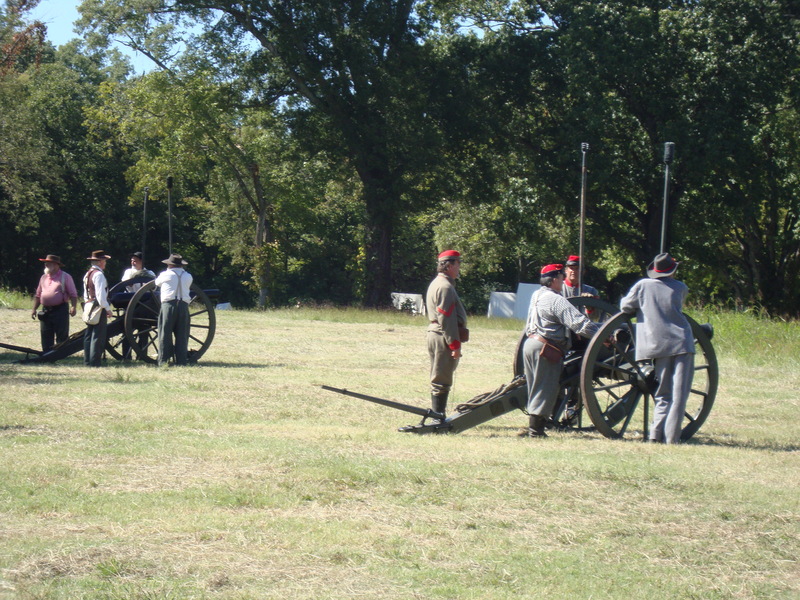 Another reenactment that took place last weekend was the 150th anniversary Battle of Farmington near Corinth, Mississippi. The original battle, May 3-5, 1862, occurred following the Battle of Shiloh, when Confederate troops were forced southward by the Union army. The result was a skirmish near Farmington, Mississippi, followed by a clash at Corinth, which happened October 3-4, 1862. On strict orders to respect the citizens, the men were on their best behavior, and didn’t disturb anything. Upon entering Maryland, the Rebels received an icy reception, which was not at all what they had expected. The Marylanders had heard from Union sympathizers in Europe that Lee expected to conscript all able-bodied men for his army. Even though that wasn’t the case, the Marylanders’ sentiments were equally divided. Hiram heard a few spectators, who were observing their march from open second-story windows, comment on how they couldn’t distinguish the generals from the enlisted men, because they were all in filthy tatters. General Lee had his regimental bands play “Maryland, My Maryland.” His men cheered while they marched through, but they were later disappointed, for they were unable to successfully recruit enough soldiers to increase their depleted ranks. One man they did recruit, however, was Bernard Kelton, who substituted for his brother. He was a stocky young man with a pleasant disposition, and because of it, Bud and Hiram took to him right away. Another was Dozier Downs, a thin, scruffy-looking character with shifty eyes. “That was right nice of you,” remarked Bud. “I’ll make certain he returns the favor,” Bernie joked. “I’m in it for the bonus,” Dozier apathetically stated. “So much for pride and valor,” Bud mumbled to Hiram. He understood what Bud meant. Soldiers forced to fight had no patriotic motivation whatsoever, and Dozier was just one example of many. “They say war can make heroes out of cowards,” he replied with a shrug, repeating what he had heard other men in the ranks proclaim. “Yeah, but it’s the exact opposite case for some fellers,” Bud added sarcastically, glancing at Dozier, who he knew was out of earshot. The men made their way through unfamiliar terrain, weighed down with haversacks, bedrolls, cartridges, weaponry, and whatever cooking utensils they deemed essential. Many were without shoes. They were also lacking in equipment and numbers, thus making their Maryland campaign miserable. The Rebels heard that General Pope had been replaced by none other than McClellan, who had turned his Grand Army of the Potomac away from Washington and was headed back in the direction of Fredericktown. The Alabamians reached Hagerstown, and awaited news from Jackson. While there, they discovered that the Maryland countryside had been left virtually untainted, unlike the ravaged landscape of Virginia. Their reprieve was short-lived, for the next morning, September 14, they were ordered to hurriedly prepare rations, and march back to Boonsborough Gap. The men learned that their sudden turnabout was due to a blunder made during the previous week. A copy of Confidential Special Order No. 191, wrapped around three cigars, was discovered by a Union soldier in Fredericktown, and given to General McClellan. The order outlined Lee’s intentions, so McClellan reacted by attempting to cut off the Confederate army, which was scattered from Harpers Ferry to Hagerstown. The Alabamians raced to the aid of General Hill, who was subjected to protecting the gap with his small army until reinforcements arrived. After struggling through a fourteen-mile march, the Alabamians arrived between three and four o’clock that afternoon, exhausted from their strenuous excursion over the mountain. The 4th was immediately put into action, commanded to attack the enemy to the left of the road with fixed bayonets. They were then ordered to their right. The men charged through an apple orchard over-laden with fruit. Starving, yet unable to pick any because time wouldn’t allow it, they forged ahead with the Texans and the rest of Colonel Law’s 3rd Brigade. Night fell before they could reach their opponents, so they positioned themselves in a sunken road for protection. The enemy continued firing into laurel trees standing several yards away, but to no avail, for the pelting of their bullets whacked into the trunks. 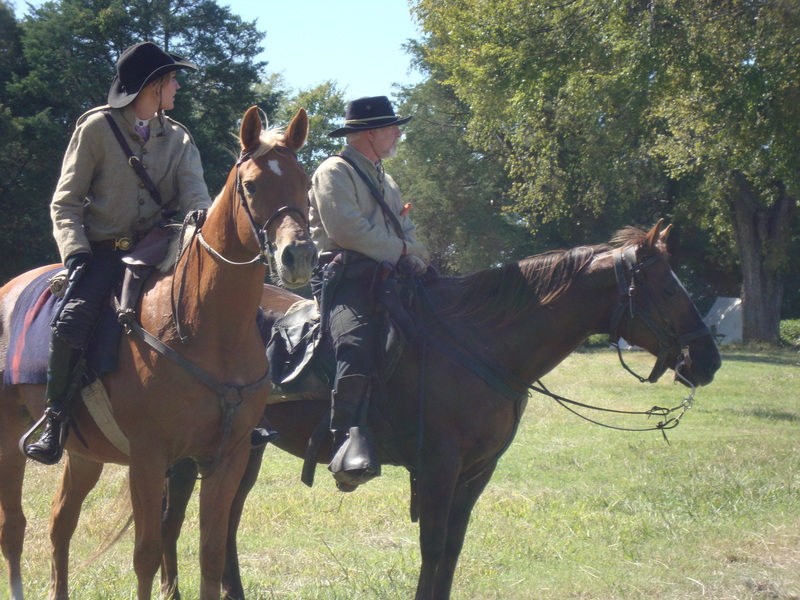 At one point, Colonel McLemore climbed up on a nearby wooden rail fence to reconnoiter, but he was hit in the shoulder. The firing tapered off, and soon Hiram and his comrades fell asleep. Around midnight, they were ordered to go quietly down the road, one at a time, in an attempt to sneak past the enemy. Carrying Colonel McLemore on a stretcher, they managed to escape, and continued on until they reached the Antietam River near Sharpsburg at noon the next day, where they learned that General Jackson had successfully captured Harpers Ferry, because McClellan was too slow to prevent it. The Alabamians found the opportunity to wash their ragged, butternut clothing, and take much needed baths. “Maybe we’ll whip them before year’s end,” said Orange Hugh optimistically. “It’s my understandin’ that if we win another battle, Europe will pay us notice, and possibly come to our defense,” said Hiram. Hiram and Orange Hugh looked at each other. “We’ll win,” Orange Hugh defiantly said with a grin. Hiram hoped he was right. My book signing yesterday at the Desoto Arts Council in Hernando, Mississippi was a great success! I would like to thank everyone for their continued support. I would especially like to thank Vicky Neyman at the Arts Council. This event gave me the opportunity to see some friends I hadn’t seen in awhile and meet new ones as well. This Thursday I will be having a book signing at the Booksellers at Laurelwood (previously Davis-Kidd) in Memphis. I will be signing copies of my new novel, A Beautiful Glittering Lie, as well as the sequel, A Beckoning Hellfire. 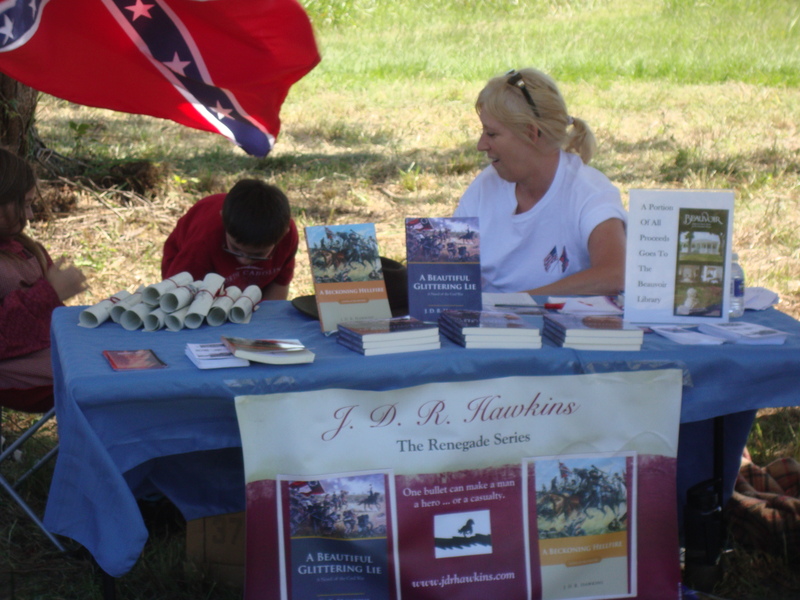 Both books are part of the “Renegade Series.” Please stop by and say hi! 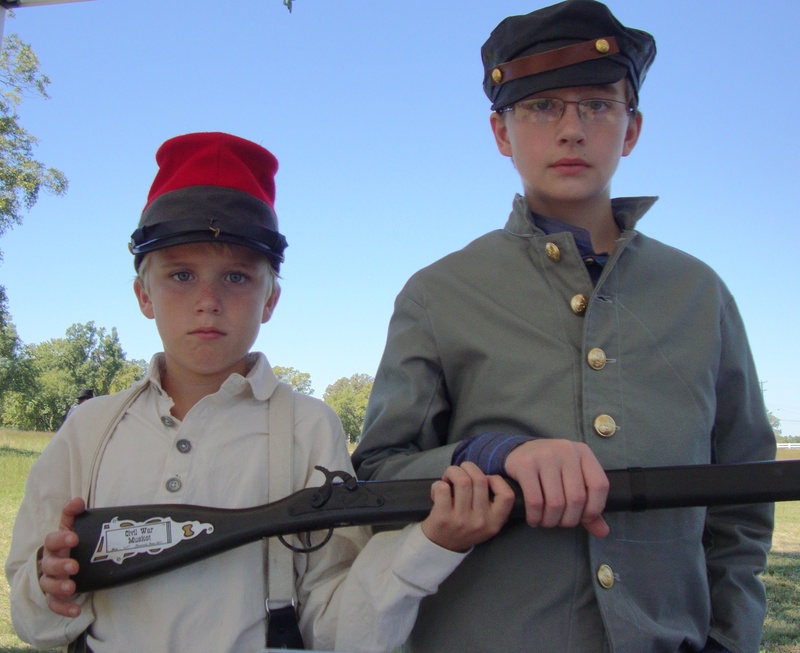 I plan on having a few re-enactors on hand to show off their Civil War era garb. Also, stay tuned for more events to be scheduled. I will be posting an excerpt from my new book later this week! To promote my new novel, A Beautiful Glittering Lie, I will be making two author appearances. This Saturday, September 8, I will sign copies of my book at the Desoto Arts Council in Hernando, Mississippi at 1:00 p.m. This is in conjunction with a craft fair and art opening at the Arts Council building, otherwise known as the historic Banks House. The second book signing will take place next Thursday, September 13 at the Booksellers at Laurelwood on Perkins Ext. in Memphis. This event will begin at 6:00 p.m. The bookstore is very accommodating for local authors, as well as touring celebrity writers. They go out of their way to make a great event, so please plan to attend. Stay tuned for further signings coming up. I will keep you posted. In the meantime, I will post another excerpt from my new novel next week! Thanks everyone for your continued support. Most Civil War buffs know about the infamous Irish Brigade, the 69th New York Infantry Regiment that fought at Gettysburg and numerous other battles. The brigade was led by Colonel Joseph Kelly. “Kelly’s Brigade,” the “Fighting 69th,” still exists to this day. But many Irish immigrants fought for the South as well. 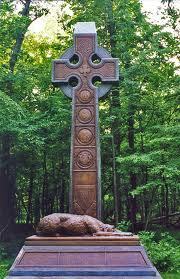 It is estimated that 30,000 Irishmen fought for the Confederacy. On September 1, 1861, the 10th Tennessee Infantry Regiment enlisted. Known as the “Rebel Sons of Erin,” these men consisted primarily of Irish-Americans. Some of their surnames included Brennan, Brien, Conley, Dougherty, Fitzgerald, Haley, Kelly, McKenny, McNichols, Murphy, O’Sullivan, Riley, Ryan, and Sullivan, to name a few. The regiment was led by Colonel Randall McGavock, whose parents emigrated from Ireland in the 1820’s. McGavock was killed at the Battle of Raymond. Patrick Cleburne, who was probably the most recognizable Irishman to fight for the Southern cause, died during the Battle of Franklin in Tennessee. Cleburne, an Irish immigrant who was born in County Cork, was known as the “Stonewall of the West.” Robert E. Lee referred to him as “a meteor shining from a clouded sky.” Other famous Irishmen who served for the South included Reverend Abram Ryan and Chaplain John Bannon.